Hi, I bought a new sentiment stamp yesterday and really wanted to use it. I usually leave them to languish in my drawer for ages! I cut the leaves from watercolor paper, gave them some veins and shaped them a bit with my stylus tool. I coloured them with a few distress inks. CAS-ual Fridays to use fall colours and a leaf. CASology where the cue card is Autumn. Addicted to Stamps & More where the theme is Clean & Simple. Simon Says Stamp Wednesday Challenge where the theme is Anything Goes. Materials used: Tim Holtz tattered leaves die: Memory Box branch die: Kaisercraft True Friendship stamp; Versafine black ink and superfine gold ep; distress inks. 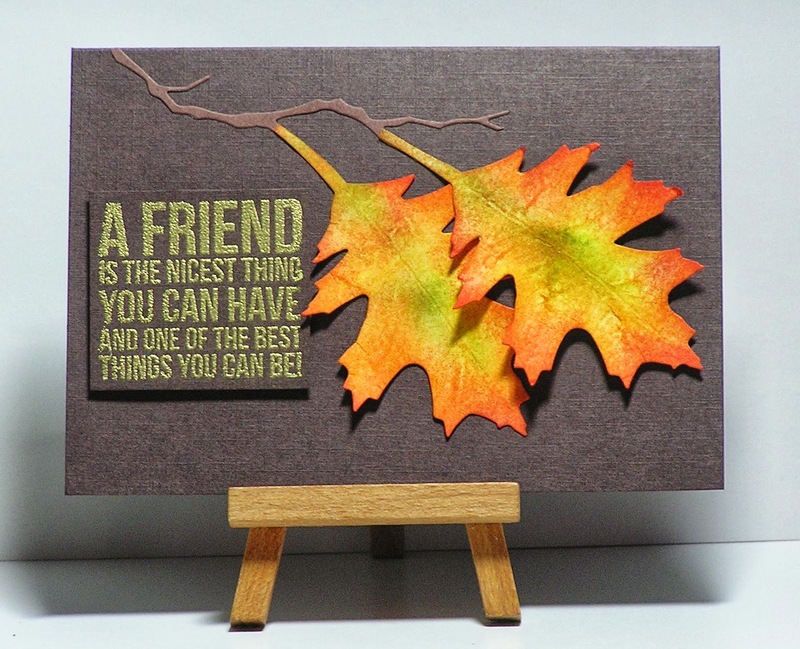 Hello Cathy, What a beautiful card, its definately CAS and stunning, simple but so effective. The leaves are so vibrant but I love them, and they co-ordinate perfectly with the stamp (which I must look out for). Just gorgeous! Those leaves look just like the ones that fall around here. So pretty. Brilliant job with the water coloring of the leaves, Cathy! They look totally real!! Oooh how beautiful, I love those leaves and autumn colors! Thanks for joining us at ATSM this week! Wow - the leaves practically glow and the colours are stunning! Thanks for joining us at CASology this week! What gorgeous leaves hanging on that twig! Very CAS and not too busy at all...in fact, it is gorgeous! So glad you joined us at CASology this week! 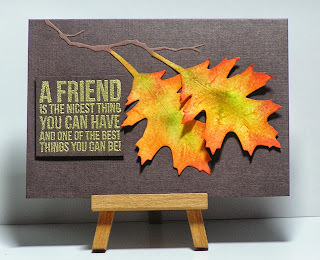 A lovely sentiment and those big leaves are fabulous! Thanks for playing along with CASology this week! Those leaves are gorgeous! They look so real! This is wonderful. I love how you used your stylus to create the veins. Thanks for playing along with us at CAS-ual Fridays!